This is something I have though about a long time now - finding a method to reliably verify sound quality differences in power amplifiers. Finally I have set up the necessary instrumentation to try out the method in practical experiments. Today good sound is easy to achieve, most of the audio playback chain can be made sonically transparent with relatively little effort and money spent. However, through building and designing amplifiers myself, and measuring and listening to many different amplifiers, I have got this controversial idea that power amplifiers can actually sound different. Obviously they sound different if you push beyond power limits, and also amplifiers can be made so good that they are transparent for any source material. But where is the limit, how good does it have to be, and what measurements can reveal the transparent ones from the only-good ones. The problem with listening tests for verification is that it is time consuming, unreliable and difficult to do proper blind testing of amplifiers. If you could test using a software abx-tester, like the one in foobar, the task would become easier. 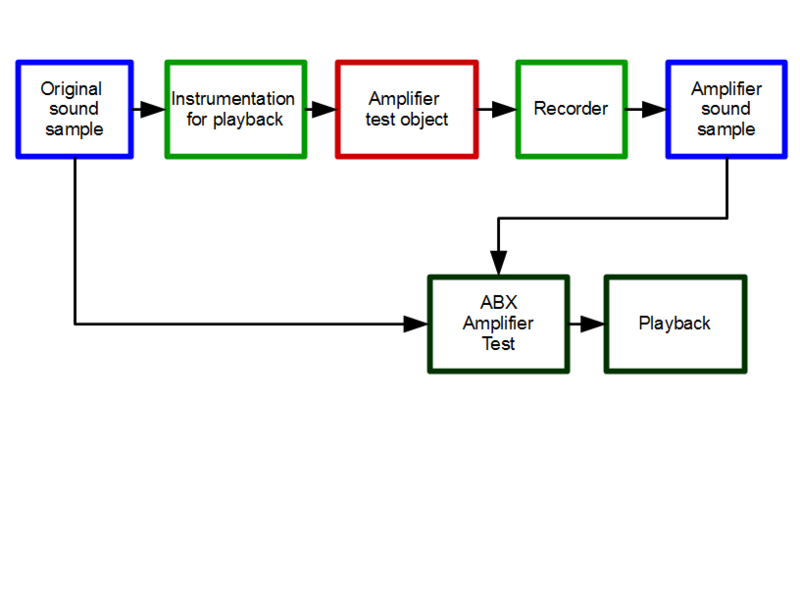 By recording the output signal from the amplifier while playing at decent volume, you get a sample file that can be compared to the original in an abx software player, and you can do the comparison on any playback system - headphones, speakers. 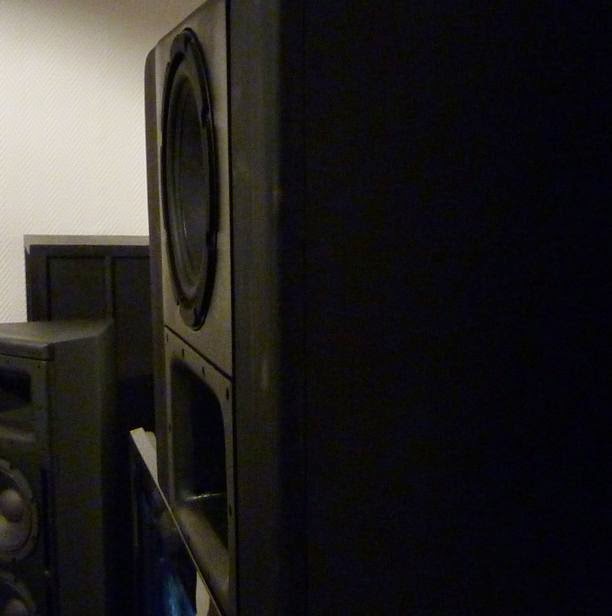 The playback will of course be affected by the amplifier in use for playback, but considering descriptions of the seemingly huge sonic differences described in reviews, it should not be a problem to hear at least some of the sound characteristics from the test object. After rigging the recording system, the first task is to verify that the recorder is sonically transparent, or at least much better than the amplifiers I want to test. The first recorder system is made easy and practical, thought I could test this first, if it fails I have some options to improve it if necessary. I recorded some samples from the output going to the amplifier, so that I can use abx to verify if there is an audible difference from the original sample to the recorded sample - with no amplifier in the loop. I also took one of the samples and sent it through this loop 5 times, as I suspected the differences would be too small to be detected. 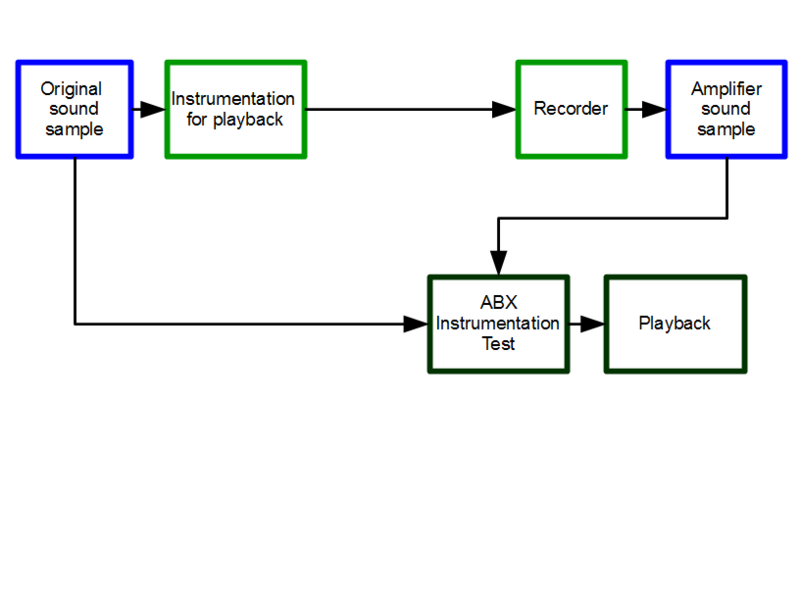 If the 5x loop sample still sounds good, then the recorder can be assumed to be good enough for the purpose. After several attempts trying to get an abx with positive outcome, I conclude I am not able to hear any difference from the original and the 5x looped sample. I used two different set-ups with different speakers and amplifiers, and I used headphones. It might be interesting to observe that the recording loop includes the DAC and pre in a commercial avr. To test that the method actually can detect differences in sound quality I encoded 128K mp3-samples and compared those to the original. I recorded 3 amplifiers, they are quite different in topology and also measures different, though amp 1 and the C15 both measure very good on parameters assumed to have significance for sound quality. The problem now is that I have a very hard time trying to hear any difference between any of the amplifiers and the original sample. They are tagged with a very brief descriptive title. Start by looking at the tuttabella_test files, do an abx of the mp3 - it is harder than you think.. The sample files are music and signal samples, in original version and sampled from the loudspeaker output of the amplifiers. Amp 1 is a very good commercial amplifier. Amp 2 is a low-budget avr. C15 is a 15W design by me. The music samples are chosen to cover different genres and style, but also for ability to reveal differences. Lots of high frequencies and voices in the Tutta Bella should be good for this purpose, the Stinky and Humming samples are more electronic and jazz-funk style with dynamics and full frequency range. The 19K+20K signals reveal high-frequency intermodulation. If you can not hear above 19K, all you hear is distortion, younger people may find it very annoying. The distortion will sound like high-frequency hiss, and a tone at lower frequency, more specific 1KHz. The 4K+10K+16K is meant to reveal high frequency distortion, mainly intermodulation, while the distortion-generating tones are also clearly audible. The distortion will sound like high frequency hiss, and a metallic tone. The tones are very annoying to listen to, and you will need to listen quite loud to have any chance of hearing any distortion. Some of the files contain signals that may or may not be audible - DO NOT TURN UP THE VOLUME BEYOND NORMAL LOUD LISTENING LEVEL. You may end up destroying tweeters or amplifiers, be careful. All music samples were recorded with the amplifier playing at a decent volume into a real loudspeaker load - just like you would normally listen to music. Level was set to -3dB below clipping for the small C15 amplifier for 0dBFS from digital source material. This equals a peak level of 10W into a 8 ohm load. I have not yet managed to get a positive result for the music samples with amplifiers. I made the im_* test signals to see if some very nasty test signals works better. And they do - I can verify a difference between amplifiers and original for those signals, which is interesting, because that indicates a possibility for audible differences in amplifiers. Further experiments could be to record amplifiers looped several times, a 4x loop will increase nonlinear distortions by 12dB, while noise only increases 6dB. If this is enough to clearly reveal differences in sound, it may be used to learn and train hearing perception because you now know what to listen for. Sample files updated due to an error on all 44.1K sample files, the error is audible on the multitone samples im2, im3. Music samples are now gain matched within 0.1dB. Additional samples from instrumentation test loop added, these are labeled xxx_test. The 5x loop test is removed, now replaced by an updated 4x loop test. It is recommended to update your sample files if you already have downloaded any previous version.